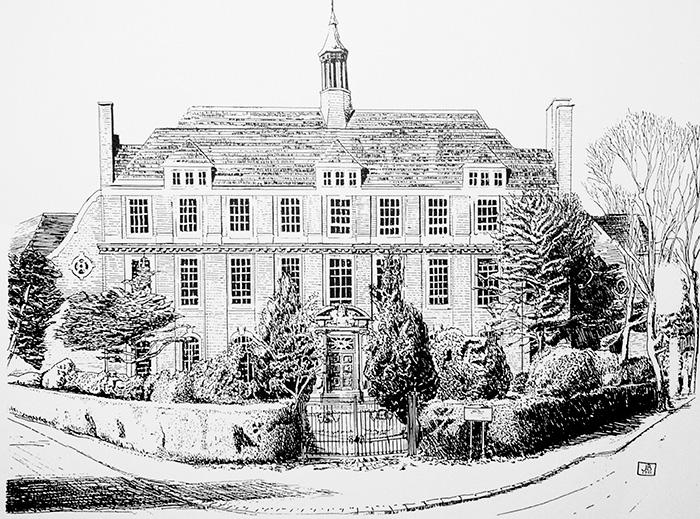 BHASVIC has inherited the mantle of the former Brighton, Hove & Sussex Grammar School which for nearly 120 years produced many distinguished lawyers, politicians, generals, admirals, engineers, artists, musicians, sportsmen and teachers. The PAST & PRESENT ASSOCIATION unites that proud tradition with the tradition already being created by the Sixth Form College. Whether you have already left the College, or are about to leave, or even if you left the Grammar School many years ago, why not join the Association. The membership fee is only £5 p.a. and it will help you keep in touch with friends from either your College days or your days at the Grammar School. There is an annual reunion, usually a lunch but occasionally a dinner, as well as a magazine, Past & Present, which is published annually. There is also an annual golf competition. The editor of the Past & Present magazine is Mark Gillingham, 11 Elrington Road, Hove BN3 6LG. The Membership Secretary is Bruce Rawlings, 48 Cleveland Road, Worthing, BN13 2ES. Download the Past and Present Association application for membership form as a PDF which you can then print out. Lunch will be in College Hall on Saturday 13th July 2019, at 1300. This year marks the 150th anniversary of The Past & Present Association, and our guest speaker is Vice Admiral Sir Peter Spencer KCB. Peter was at the school between 1958 and 1965. We hope many members and guests will be able to join us. During the coming holidays, Mr Louis Ginnett, ROI, hopes to place in position as his own gift the last of the panels in the School Hall. 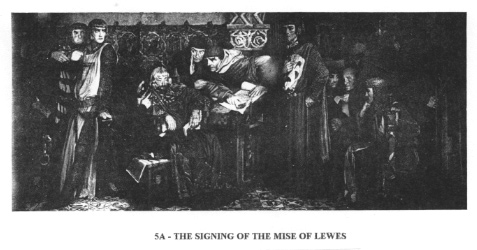 To commemorate this remarkable achievement, the Editor has offered the opportunity of placing on record the progress of the scheme, and of writing an appreciation of the message which the artist has conveyed to one who is a mere layman in art, but has repeatedly used each successive panel to bring home more vividly to recent generations of Grammarians the Story of Man in Sussex. 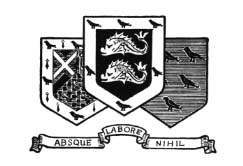 Two extracts from Past and Present explain the origin of the scheme: 'On January 20 1913, the Governors of the School accepted the Old Boys' gift of carrying out in part Mr Louis Ginnett's scheme for the decoration of the new School Hall with a series of panels illustrating the History of Man in Sussex, …. The School architect, Mr S B Russell, FRIBA, cordially approved the scheme of decoration and remodelled the wood panelling of the Hall so that painting and panelling shall constitute one harmonious whole'. Thus in August it will be possible, for the first time, to see the Hall as the architect conceived it. Throughout, the artist has kept this aim in view and has shown marked skill in overcoming the limitations, as well as in making full use of the opportunities which such a scheme involved. During the War, Mrs Read died, and Mr Read, on the re-opening of the School after it had ceased to be a military hospital, presented the fourth panel as the Ellen Read Memorial, in memory of his wife, 'the school-mother, 1894-1918.' To those who knew her, and especially to many a Marshall House boy, there could be no fitter memorial than one in the School Hall, between that to E J Marshall and that to the sons of the School who gave their lives in the War, 1914-18. For it is to them that the fifth panel, with its flanking rolls of honour, was dedicated by the Right Rev H K Southwell, Bishop of Lewes, and former Assistant Chaplain-General to the Forces, in February 1923, when Lt Col H C Saunders, DSO, presented it to the School on behalf of the Old Boys. 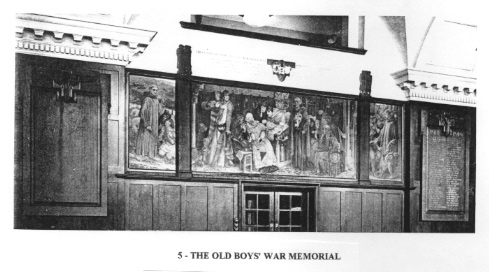 With the sum left over from the War Memorial Fund, augmented by gifts from parents and Old Boys, the sixth panel was commissioned, in June 1927, and the artist himself spoke to the School on his scheme when it was first put on view at the beginning of the Autumn Term, 1928. On November 20, 1936, at the Annual Prize Giving, Mrs Mills unveiled the seventh and eighth panels as part of the Memorial to her father, Headmaster from 1899-1924. She herself, and other members of the family, helped considerably to make this possible, as an addition to the furnishing and equipment of the new Library. Finally, in 1939, as his own tribute to his School, and former master, the artist himself presented the ninth and last panel to complete the Hall as designed by the architect. Seldom can a School Hall have had such an aid to build up a tradition - the Story of Man in its own county designed and executed by an artist who himself was an Old Boy and presented by those who held dear the memories of E J Marshall, Ellen Read, the Old Boys who gave their lives in the War of 1914-18, and of him who bridged the whole period, Thomas Read, Boy, Assistant Master, Headmaster and President of the Old Boys' Association. With the completion of the last panel it is at length possible to appreciate the artist's message as a whole. When speaking at the beginning of the Autumn Term, 1928, he told the School of his feeling that, through all the changes of history, there remained something enduring in types of character. Again and again he brings this out, not only in his principals, but also in the crowds, whether they surround the Roman prefect, William the Conqueror, Henry III, William Coxon, or George IV. 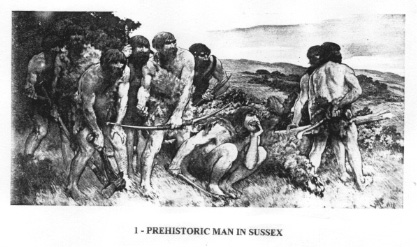 In 1912 and 1913, when the earliest panels were being discussed, Sussex had just become the centre of prehistoric interest as a result of the recent discovery of the Piltdown skull. 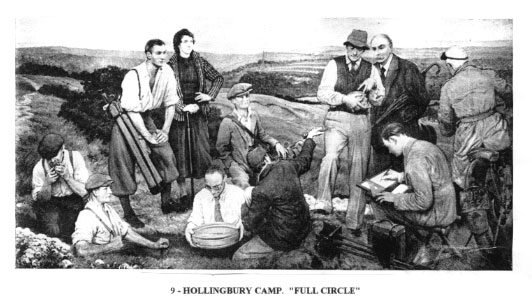 Already the great flint mines of Cissbury were well known. So the series begins with primitive man returning to his Downland habitation from a raid in the Wealden forest in search of prey. He is just beginning to use those lofted stone axes which, with other tools, were helping him to take the first step along the road to civilisation, by tilling the soil and keeping herds and flocks. At the tenth milestone along the road which leads from Chichester to London the Prefect of the Province built for himself a house when Hadrian was Emperor. The prefect with two of his men in attendance has ridden to Bignor to inspect the work on his new villa and to discuss further plans with his architect. Native onlookers watch him and the foreign workmen who are fashioning stone for the building – a symbol of Roman order brought to an outlying province. The third panel brings out vividly the end of that order. ‘In this year Aella and Cissa besieged Andredesceaster (Pevensey) and slew all that dwelt therein, so that not one Briton remained alive there. A.D. 490.’ For many a year the marauding Saxons had ravaged these shores and burnt towns and villas. As early as the end of the third century the governor of the province had reorganised the defences by building the forts of the Saxon shore. When the Romans left Britain to its own resources, the raids grew more frequent, until at last the Saxons felt strong enough to stay and destroy the symbols of Roman power and Christianity. After a siege the fort fell and the inhabitants took refuge in the temple, and sheltering behind their horrified bishop, saw the statue of the emperor overthrown and the altars and symbols of their faith broken and derided by the ruthless pagans. Through many ups and downs these Saxons, with later invaders, built up a Christian civilisation of their own which, in its turn, had to meet successive raids of Northmen until it fell before the Knights of William of Normandy. After the battle of Hastings, a chronicler tells how ‘the mother of Harold, bowed down by agonies of grief, sent to the Duke, himself, craving for his pity for an unhappy woman bereft of her three sons, and begged him to return to a widow the body of one of the three she had lost; or, if it pleased him, she would hand over the weight of the body in pure gold. But the angry Duke unhesitatingly refused her request, swearing that he would bury it beneath the sands of the seashore’. Such a burial in unconsecrated ground was the lot of those who died excommunicate, as Harold did for breaking his oath. Thus another invader, backed by the Hildebrandine reforming movement in the Church, set his hand to the task of moulding an English nation to his will. ‘Not until Master William Coxon brought back our ship but little hurt – had we sure knowledge that the King of Spain’s great Navy was scattered and broken, so that we were made aware of the clear mercy of the Lord, and that a very eager period to the realm and to our faith had passed quite away. Rye, August, 1588.’ The bright flag – a trophy from a Spanish ship – so proudly shown, stands out against the breaking dark clouds to symbolize the part which these same Sussex men played in Elizabethan times to save their country by the prowess of her seamen and the soundness of her ships, built mainly of Sussex oak, from the threat of the mighty Empire of Spain. This panel, with its two small flanking panels, shows the characteristics of this English nation, at the height of the Middle Ages, under the influence of the Friars, and the growing middle classes in town and country. When Henry III and his foreign favourites tried to govern in the interests of themselves and the Papacy, Simon de Montfort called on these middle classes to curb the King and defeated him at Lewes. ‘Read, ye English, this record of the battle of Lewes, under the protection of which you live defended. Because if victory had fallen to those who were this day conquered, they would have held the memory of the English in low esteem.’ (The Song of Lewes). 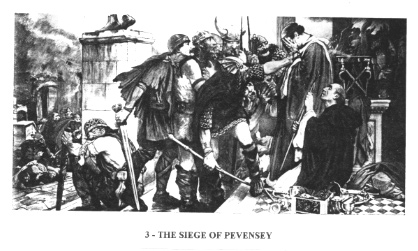 Simon de Montfort, leaning heavily on his stick, attended by the Earl of Gloucester, and other nobles, forced the King, in the presence of the indignant captive, Prince Edward, to sign the Mise of Lewes, promising to dismiss foreign favourites and to cease to be the tool of the Papacy. 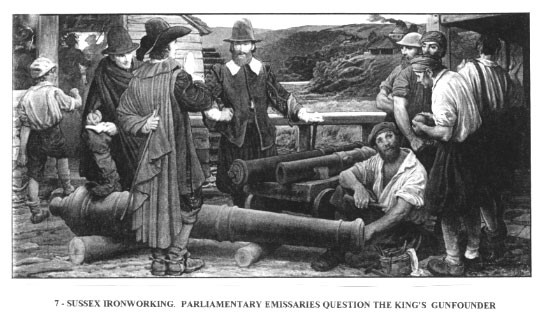 "The Parliament sent two members down into Sussex to summon Mr John Browne, the King’s gun founder, to appear before them so that his position may be made clear to him, 1642.’ Sussex was not only the source of much of the oak to build England’s Navy, but also the home of the chief ironworkers of the kingdom. So among the first tasks of the Parliamentary leaders on the outbreak of the Civil War was that of securing the control of such an important industry, and Sussex was again destined to play its part in that constant struggle which made modern England. 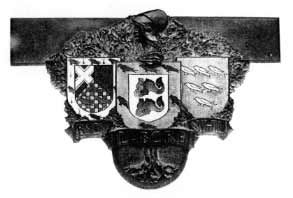 "The Parliament sent two members down into Sussex to summon Mr John Browne, the King’s gun founder, to appear before them so that his position may be made clear to him, 1642.’ Sussex was not only the source of much of the oak to build England’s Navy, but also the home of the chief ironworkers of the kingdom. So among the first tasks of the Parliamentary leaders on the outbreak of the Civil War was that of securing the control of such an important industry, and Sussex was again destined to play its part in that constant struggle which made modern England. The gift of the Artist. "Full Circle"
The scheme is completed and the artist links all together. On the heights above the town, seen in the background, near the camp on Hollingbury Golf Course, excavators turn up a skull of one of the ancient Britons depicted in the first panel. Watching them are people in the dress of 1926 – golfers, a motor cyclist, and a Grammar School boy among them. One of the excavators holds up the skull for the inspection of him around whom so much in this Hall centres – Thomas Read. 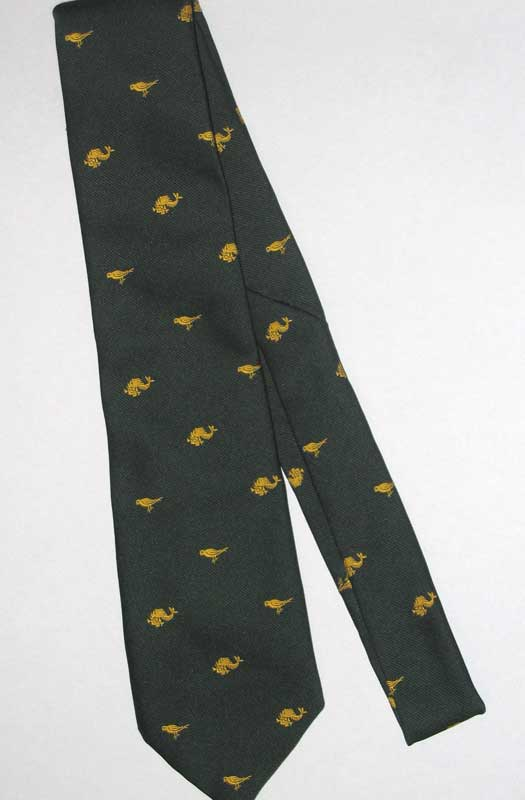 Educated under E J Marshal, he had taken part in the march from Grand Parade to Buckingham Road; he had worked for years to bring to fruition his scheme for the new school; he had led the school from Buckingham Road to Dyke Road. To the artist he must have been one of those Sussex characters who helped in his quiet way to build England, and here in this Hall his memory is surrounded by memorials to many of those to whom he devoted his life. The book describes my life as a scientist who was prominent and influential within his field and gained much satisfaction from his career. 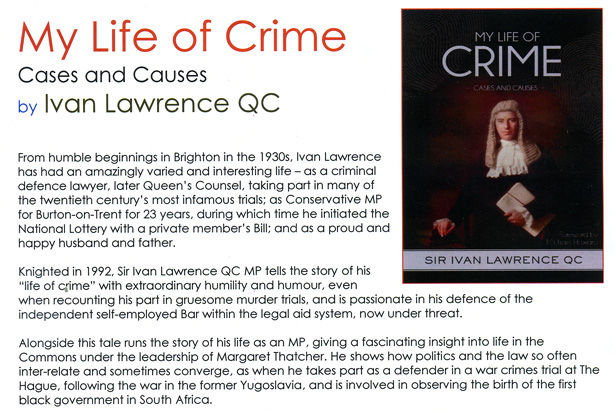 It is an account of my life at school and at several outstanding universities in England and the USA. At each stage it relates my work to personal circumstances and aims to impart something of the flavour of my career, both its pleasures and its pains, and the personalities that were major influences on its development. It outlines fragments of the science in a way that makes them readily accessible. It reveals for the first time events that were kept ‘under wraps’ until now, notable among them being touch-and-go fights to secure funding for the research from both British and American sources and fraught relationships with tobacco companies arising from studies of nicotine and tobacco addiction. Above all, it is about diversity; the diverse teaching and administrative tasks that university-based scientists take on in addition to research, the diverse countries from which members of research groups originate, and the diversity of work for international societies that are vital for the progress and expansion of research fields. There are 224 pages and fifty illustrations.